The value of the biggest recorded music market in the world moved in the right direction last year. 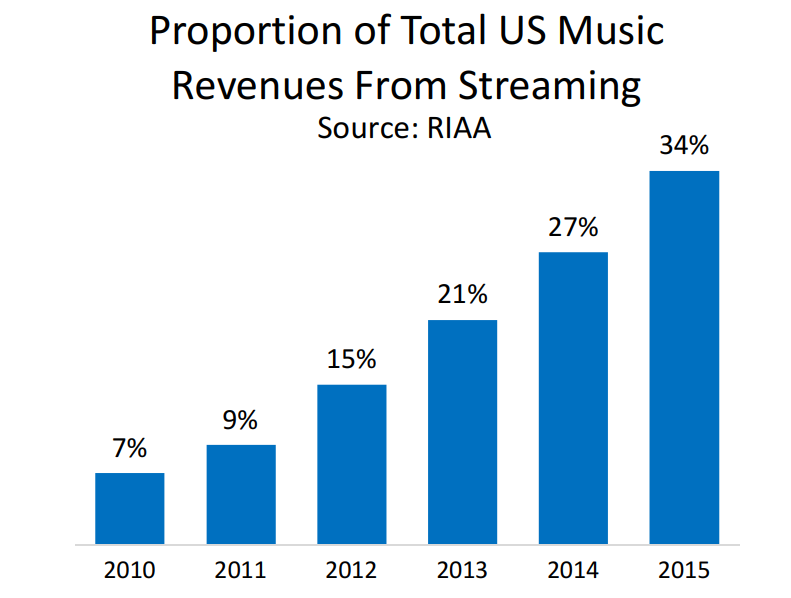 Driven by streaming services like Spotify and the introduction of TIDAL and Apple Music, the overall retail income of the US recorded music market increased 0.9% in 2015 to $7.02bn according to the latest RIAA stats. The wholesale value of the US market – that’s the money taken home by labels and artists – also grew, up 0.8% to $4.95bn. It was the fourth year in a row that wholesale income had grown. Drilling down into formats, income from downloads declined 10% to $2.3bn, yet the total value of digitally distributed formats was up 6% to $4.8bn, compared to $4.5bn in 2014. That was because of another year of impressive growth for streaming services. In particular, paid-for streaming services. Premium subscription streaming income jumped 52.3% in the year to $1.22bn. 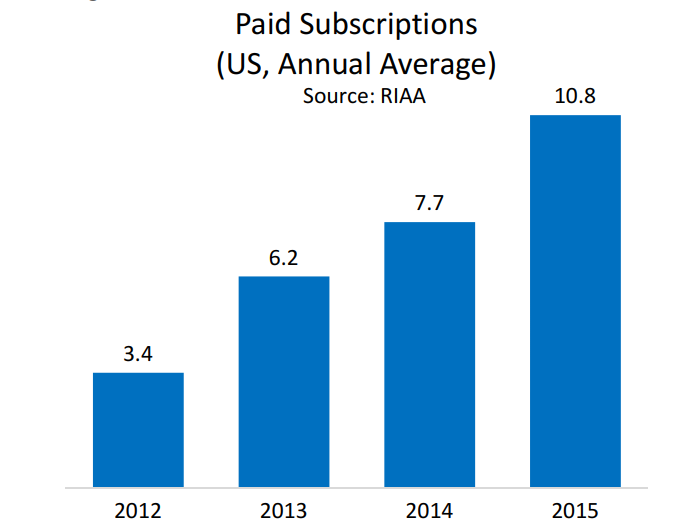 At the same time, the number of paid subscriptions grew 40% to an average of 10.8 million for the full year. Ad-supported streaming revenue from the likes of SoundCloud, YouTube and Spotify’s free tier grew slower, up 30.6% to $385.1m. Streaming revenue from non-interactive services such as Pandora, paid through to SoundExchange, contributed $802.6m, up 3.8%. 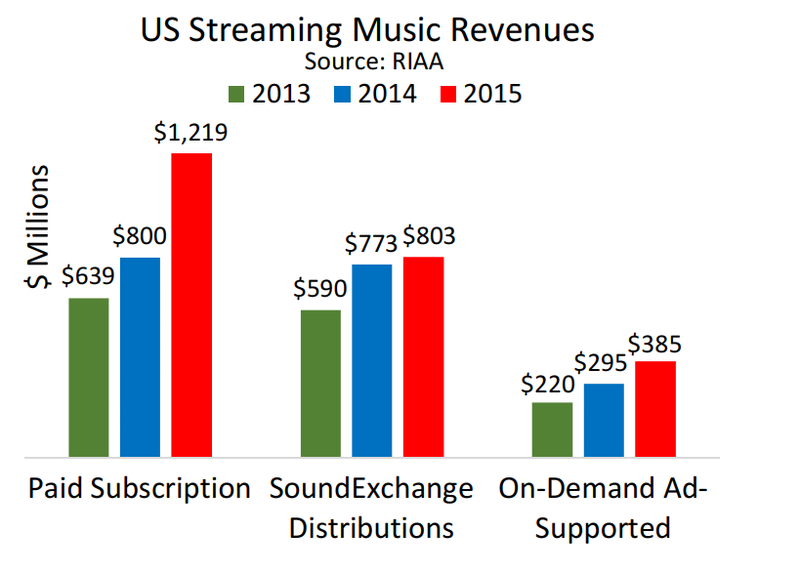 Including SoundExchange, total streaming income hit $2.41bn in the year. Interestingly, that was significantly more than the financial tally accrued by both digital album sales ($1.01bn, down 5.2%) and CD album sales ($1.52bn, down 17%) – and not far behind their combined revenue of $2.53bn. Of that total streaming figure, paid-for services contributed 51%, ad-funded contributed 16% and SoundExchange made up 33%. Elsewhere, single-track download income fell 12.8% to $1.23bn, meaning that the combined tally of downloads ($2.32bn) was smaller than total streaming revenue for the first time. Meanwhile, vinyl albums continued their ascent, climbing 32.2% to $416.2m. Vinyl singles added another $6.1m. 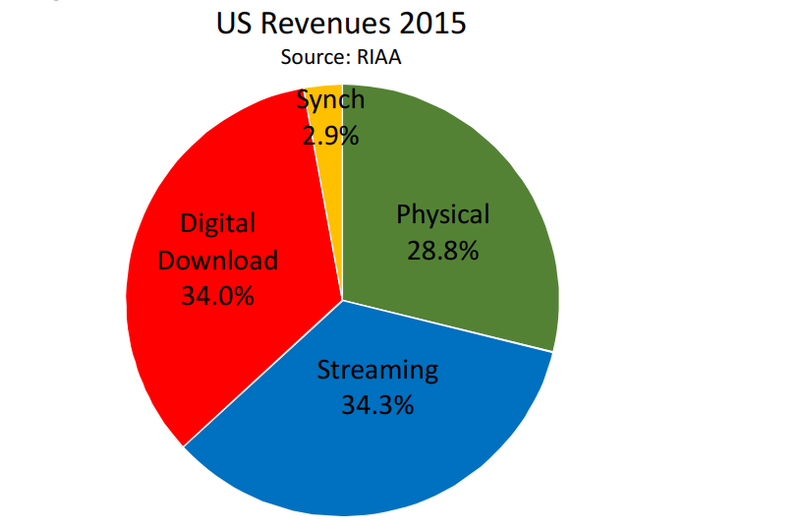 Sync royalties grew 7% to $202.9m. The comparative paucity of cash that came from ad-funded, on-demand services is a major taking point of the market – not least because all of the retail revenue taken from the category ($385.1m) was smaller than that taken from vinyl. Overall, streaming claimed 34% of the total value of the US market, slightly outperforming both physical and download. 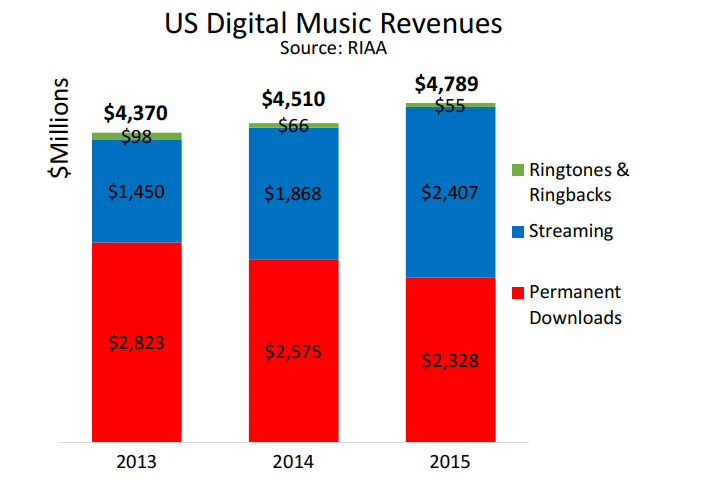 Download the RIAA’s full-year report through here.